Bane has no super human powers. He is at the height of physical fitness and is trained in hand-to-combat and the use of firearms. He is an expert strategist, escapologist, possesses a photographic memory and is a polymath. Genius: Bane is also highly intelligent; Ra's al Ghul says that Bane "has a mind equal to the greatest he has known". In prison, he taught himself various scientific disciplines equal to the level of understanding of leading experts in those fields. 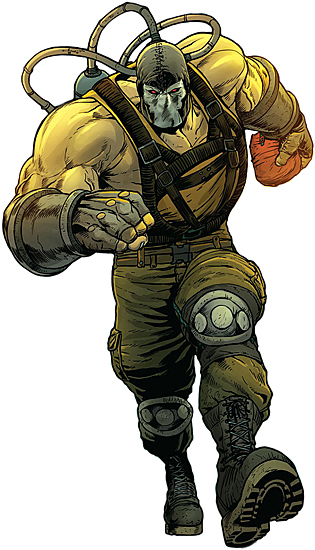 Venom Feeds: At the start of his career Bane wore two wrist mounted devices that when activated injected gene-altering venom into his body. The venom enhanced Banes strength, durability, speed agility, endurance and healing to almost super human levels. Bane has at times been addicted to the venom. Born to serve the life sentence of his father, Bane's childhood and early adult life were spent behind the walls of Peña Duro, an infamous prison located in Santa Prisca. Though imprisoned, his natural abilities allowed him to gain extraordinary skills within the walls of Peña Duro. He read as many books as he could get his hands on, built up his body in the prison's gymnasium, and learned to fight in the merciless school of prison life. Despite his circumstances, he appears to have found teachers of various sorts during his incarceration, ranging from the hardened convicts who were his company from birth to an elderly Jesuit priest under whose tutelage he apparently received a classical education. Bane would murder this priest upon his return to Santa Prisca years later. However, he committed the first of his murders at the age of eight, stabbing a criminal who wanted to use Bane to gain information about the prison. As an adult, he became a test subject for a mysterious drug known as Venom, which had killed all other subjects. It nearly killed him at first, but he survived and found its effects enhanced his physical strength, although he needed to take it every twelve hours via a system of cables pumped directly into his body or he suffered debilitating side-effects. Years later, Bane escaped Peña Duro, along with several accomplices (his friends Trogg, Zombie and Bird). His ambition turned to destroying Batman, whom he had heard tales of while serving his sentence, becoming fascinated with Gotham City as, like the prison, it was a place where fear ruled, in this case, fear of the Batman. Bane was convinced that the demonic bat that haunted his dreams since childhood was a representation of the Batman.